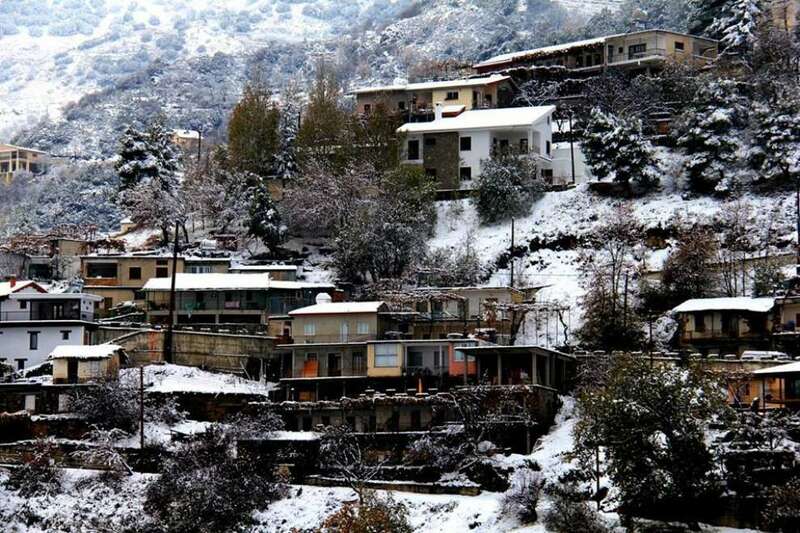 Polystypos is a village in Nicosia, built at an altitude of 1150m above sea level and it is one of the tallest villages in Cyprus. 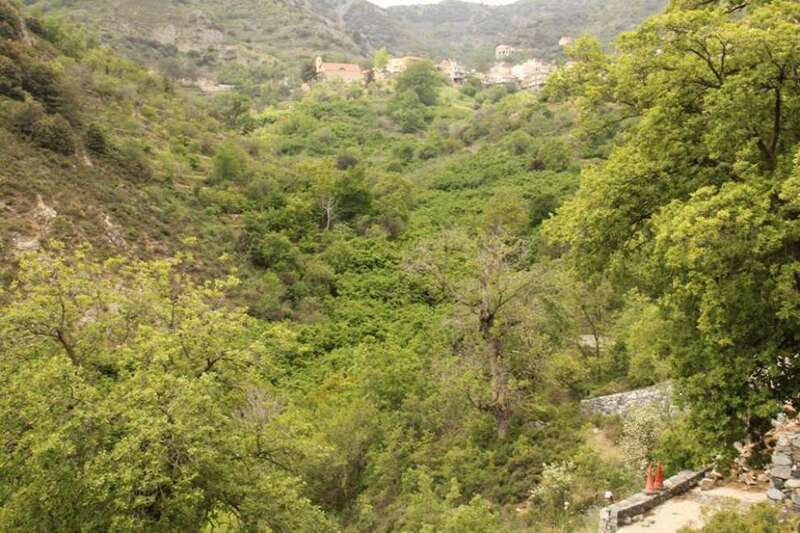 Polystypos is also the third smaller administrative area in the Nicosia District, with an area of ​​239 hectares. The traditional character of Polystypos has been preserved and it is one of the most picturesque villages of the Mediterranean with traditional houses and alleys. 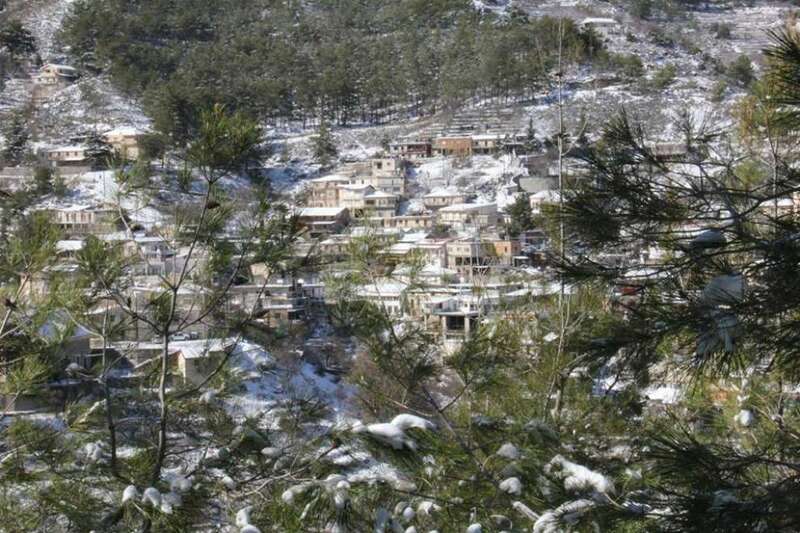 During the winter season in the village there is a heavy snowfall, which adds even more to its picturesque charm. The exact date of establishment of Polystypos is unknown and the various investigators have not reached a safe conclusion. It is sure, however, that the village existed from medieval times. The French historian De Massa Latri reports the village of Polystypos as Polistipia and includes it among the royal estates of the Frankish period. According to other researchers, the village of Polystypos was originally called "Apostolos Andreas" as evidenced by medieval documents, namely a 1573 map of the great Dutch cartographer Abraham Ortelius. Ortelius has a settlement named "Apostolos Andreas Polystypos", while in the manuscript of the Museum, Polystypos refers to the mountainous villages of Saint Rinc. 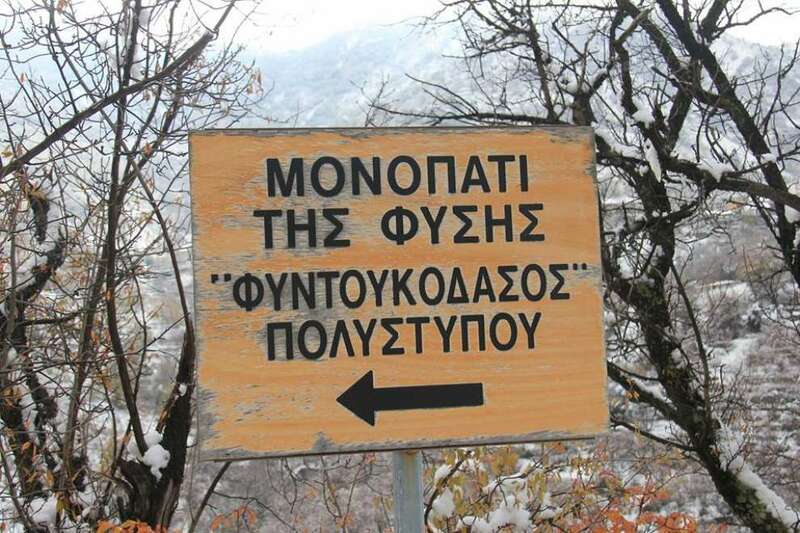 According to the tradition, the founding of the village is related to a neighboring settlement built near the monastery of Apostle Andreas, named "Avlonitis". Thus, it is speculated that the word Polystypos probably originally was an epithelium of the Monastery of Apostle Andrew, also called "Apostolos Andreas Polystypos" and later became the name of the settlement that was founded near the Monastery. Another theory states that the settlement named Avlonitis was abandoned and another nearby was set up, at the site where Polystypos is built today (2018), without of course excluding the fact that there were two settlements and the inhabitants of one abandoned their settlement and settled in the other that already existed. The name of the village is complex and consists of the words "Poly (very)" and "Stypes (shots)" which means many vineyards. Polystypos means, therefore, a location with many vines. According to the history of the village, it was formerly full of vines, which faded significantly during the Ottoman occupation in the 18th century, when most of them were abandoned as unprofitable when special taxation was imposed on wine production. In Polystypo you will find the Holy Church of St. Nicholas, built in 1908-1912, in a Frankish-Byzantine style. The previous church of St. Nicholas was exactly at the same place and its dimensions were about 14m long, 5m wide and 8m high. After the demolition of the old temple, its iconostasis and all its images were placed on the new one and formed the iconostasis of the new temple. The old temple was built between 1832 and 1834. Additionally, in Polystypos you will find the unique chapel that has survived in Polytypos of the many ancient churches, the chapel of Apostle Andrew. It is a one-aisled temple with a wooden roof and anchored tiles. 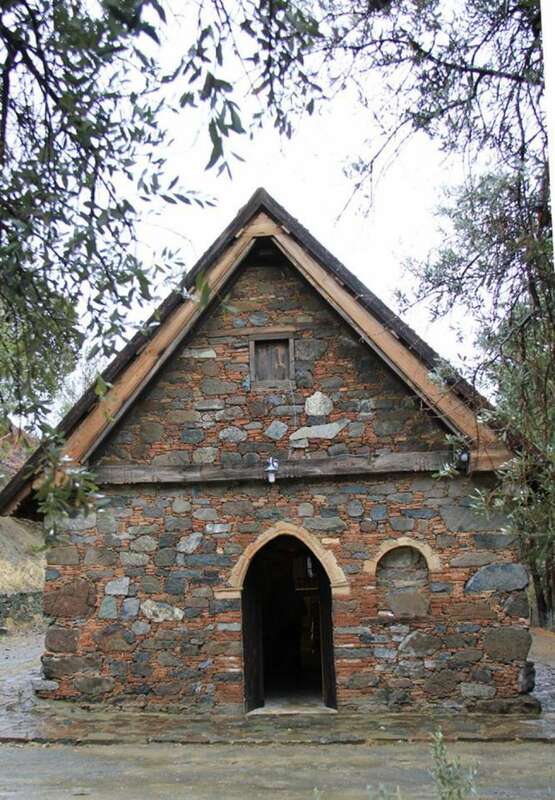 The chapel of Apostle Andreas is built outside the village and is the last remnant of an ancient monastery of Apostle Andrew of Polystypos as it was known. The chapel today (2018) operates four times a year and as an ancient Byzantine monument is under the protection and supervision of the Department of Antiquities. You can visit the community park of the village at the "Laoudas" site called "Pantheon", which is a daily attraction for many visitors. It is a green paradise. Next to the playground, the monument to the heroes of the village is dedicated to the two heroes of Polystypos who fell in the liberation struggle of 1955-1959, Christos Tsiartas and Andreas Panagiotou. The community, with the help of the state, established an ancient path that traverses the herbaceous forest as a 1300-meter-long path of nature that penetrates through remarkable points of the village, such as the downstream fountains, springs, streams, vines, wild vegetation and colourful flowers. Throughout the path, the lush nature and fresh air are dominant. The nature trail of the Polystypos village, 1.7 km long, it is part of the Natura 2000 European Nature Conservation Network.